Wall-mounted via screw holes on top and bottom flange. Smeg products are typically delivered within 1 - 2 weeks. Their home delivery team will contact you promptly to arrange a convenient day and, where possible, time slot. Smeg range cookers are delivered by a specialist two person crew who will unpack your cooker for you to inspect. Smeg Victoria range cookers are covered by a 5 years parts and labour guarantee - all other Smeg models are covered by a 1 year parts and labour guarantee. A stainless steel splashback with NO utility rail, from Smeg. A wall-mounted splashback can be the finishing touch for your cooking area, providing an attractive and practical surface to cope with those inevitable little splashes. Standard delivery is free with all Smeg products. 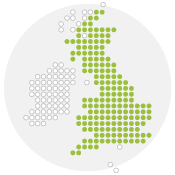 Smeg deliver to mainland UK only, with the exception of highland postcodes. See below for a list of couriers customers have previously used for deliveries outside this area.